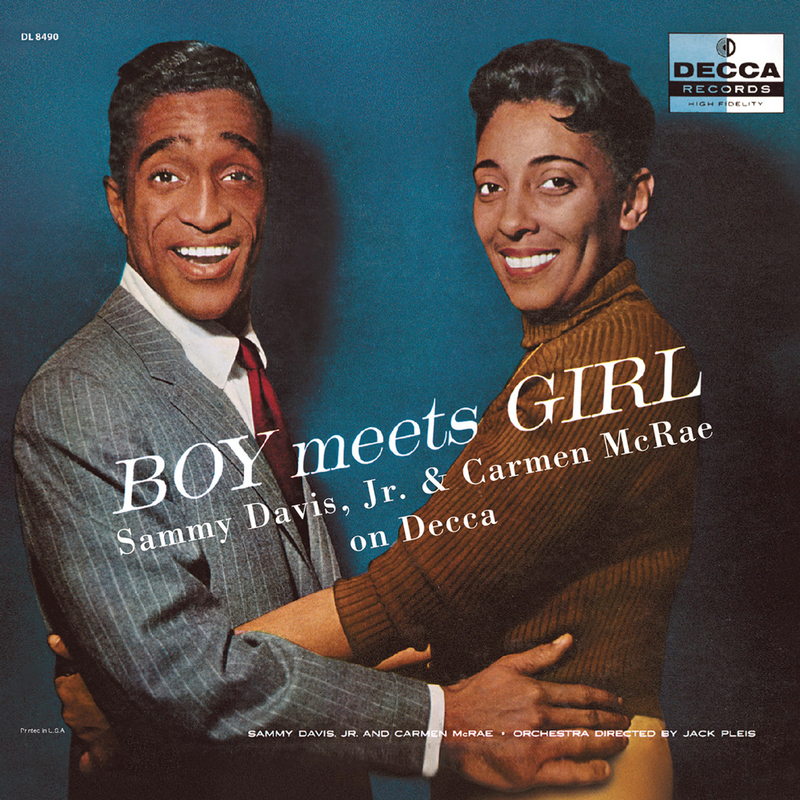 In 1954, Milt Gabler, Decca Records’ A&R executive, signed both Sammy Davis, Jr. and Billy Holiday protégé Carmen McRae to recording contracts, and so at some point it made sense to pair Decca’s two new stars together (McRae was Down Beat Magazine’s ‘Best New Female Vocalist of 1954’, and in August that year Sammy had the #1 single on the CashBox charts). In early 1955, together they recorded two duets: “A Fine Romance” and a brand new novelty number given a cha-cha beat, “I Go For You”. Despite Sammy and Carmen’s obvious chemistry (of “A Fine Romance” Billboard said: ‘They make an appealing duo, getting the most out of the ditty’s clever lyrics’), the resulting single didn’t sell particularly well. In November 1956, Verve released the landmark album Ella and Louis with Ella Fitzgerald and Louis Armstrong, and soon it was the #1 jazz album in the nation. Accordingly, record labels quickly discovered a taste for jazz vocal duets. In 1957, Mercury released Sarah Vaughan and Billy Eckstine Sing the Best of Irving Berlin, Verve released Ella and Louis Again, and the following year RCA Victor released Fancy Meeting You Here, featuring Bing Crosby and Rosemary Clooney. 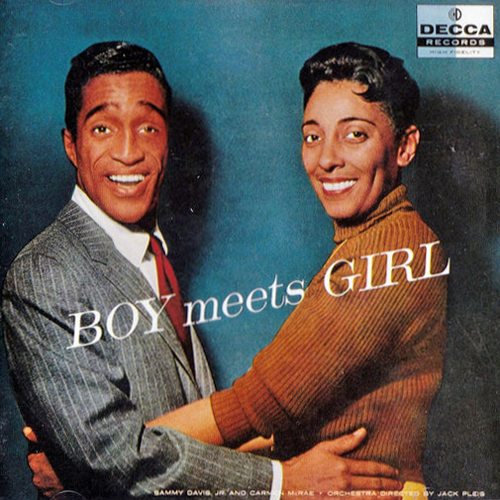 Meanwhile, Decca Records had their own pairing of top talent to throw into the mix, and in February 1957, Sammy Davis, Jr. and Carmen McRae reconvened behind a microphone in New York, this time to record a full length album, Boy Meets Girl. Sammy’s tomfoolery can occasionally grate, but the two sound like they are genuinely having fun, and Sammy plays it straight on enough of the tunes to balance out the horseplay. With Jack Pleis’s winsome arrangements keeping the duo swinging, the result is a particularly charming disc with numerous delightful moments. 11 new sides were cut of top drawer material (Gershwin, Porter, Berlin, Rodgers, Hart, etc) and placed with “A Fine Romance” for inclusion on the LP, which was released in August 1957. CD reissues later added “I Go For You” as a bonus track. While neither artist was at the peak of their powers in 1957, this is an oft-overlooked marvel for aficionados of vocal jazz. There’s a Small Hotel: Davis and McRae are at their romantic best on this Rodgers & Hart number, which was being featured at the time in the 1957 film Pal Joey. 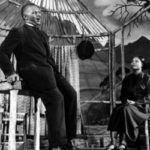 You’re The Top: Jack Pleis’s nice arrangement includes Cole Porter’s excellent verse, and Carmen and Sammy romp through one of Ethel Merman’s signature tunes with aplomb. Baby, It’s Cold Outside: This take on Frank Loesser’s famous call and response holiday novelty will put a smile on your dial; you can tell they’re both grinning through this, and Sammy cracks Carmen up several times! 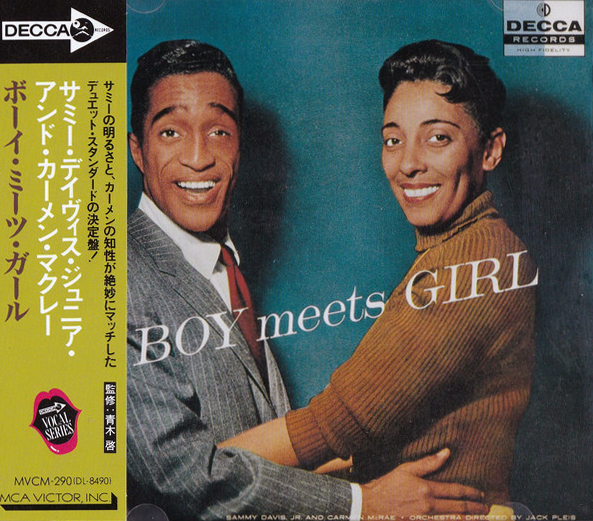 Boy Meets Girl has received a direct reissue on CD in Japan in 1989 and 1993. 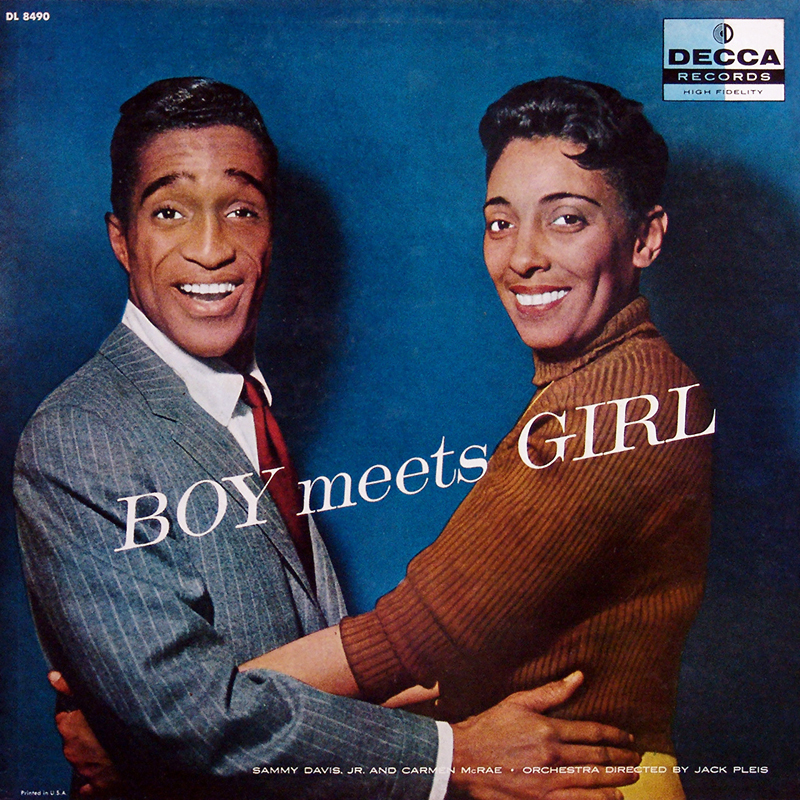 In 2005, Verve in the US reissued Boy Meets Girl as part of a special twofer with Porgy and Bess (which also features Carmen McRae). The album can currently be purchased digitally at both iTunes and Amazon (links above). For Festival’s Australian release of the LP, they oddly switched out “Happy To Make Your Acquaintance”, replacing it with “I Go For You”. Reissue in Japan by MCA included “I Go For You” as a bonus track, making 13 tracks in all. 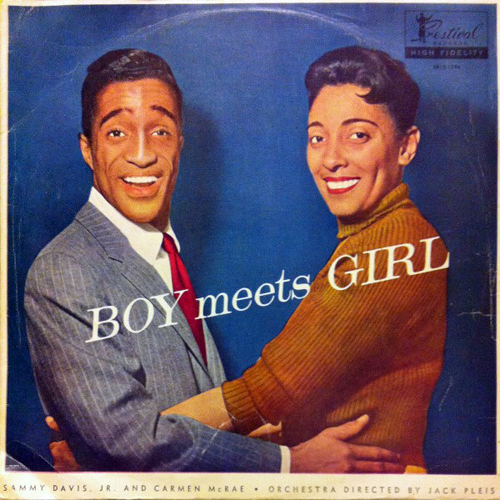 A lovingly produced official reissue, combining Boy Meets Girl with Porgy and Bess. Includes “I Go For You”, making 23 tracks in all. 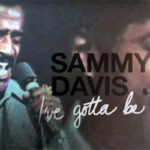 Features excellent liner notes from Sammy biographer Wil Haygood, photos of Sammy and Carmen from the recording sessions, album art reproductions, and full discographical information.